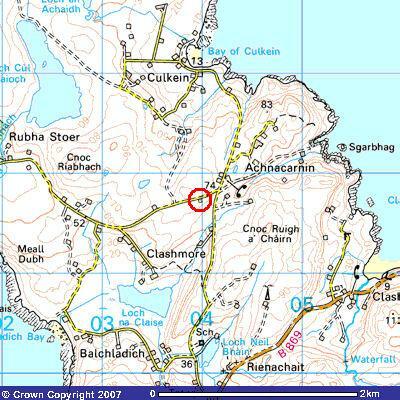 Clashmore is located in Sutherland on the north-west coast of Scotland, about 10 miles north of Lochinver and 100 miles north-west of Inverness. First make your way to Inverness. The fastest route from England and the south is to take the M6 and M74 towards Glasgow. Then take the M73, A80, M80, M9, finally joining the A9, passing Sterling and Perth to reach Inverness. It’s a good idea to fill up with petrol here – take either the A96 or A82 exits into Inverness and fill up at either the Esso or BP filling stations. 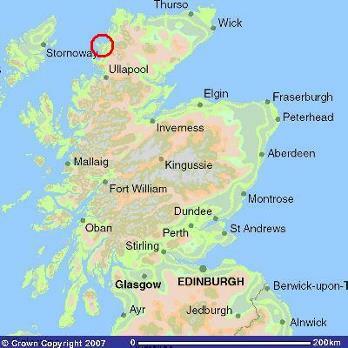 (Petrol is available in Ullapool and Lochinver, but it is expensive and the filling stations don’t open late). 24 hour shopping and petrol is also available from Tesco, in the retail park 1 mile along the A96 going east towards Inverness Airport and Aberdeen. After filling up, return to the A9 and head north towards Ullapool – you are now about 100 miles and 2 hours drive from Clashmore. The road crosses the Moray Firth on the magnificent Kessock Bridge onto the Black Isle; after 6 miles turn left at the Tore roundabout onto the A835 signposted Ullapool. Keep on this road through Ullapool travelling north until you reach Ledmore junction, where you turn left onto the A837 for Lochinver. 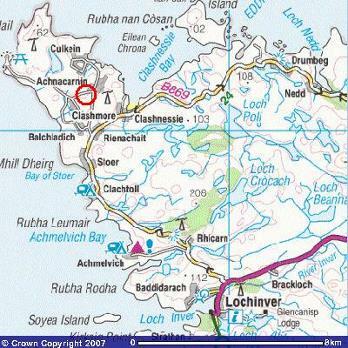 A mile before Lochinver turn right onto the B869 single track road and after 7 miles continue through Stoer, and three quarters of a mile later turn left, signposted to Stoer Head Lighthouse (opposite the Stoer Village Hall). Just over a mile further on take a sharp left turn towards the lighthouse, and Achard is a few hundred yards on the left. Parking is on the opposite side of the road to the house. An alternative scenic route from Inverness is to continue north on the A9 instead of taking the Ullapool turn-off. 5 miles after crossing the Cromarty Firth (causeway / bridge) turn left onto the B9176 (ex A836) signposted Bonar Bridge. At Bonar Bridge, turn left, keeping on the A836, and 5 miles later turn left onto the single track A837 towards Lochinver, picking up the route described above at Ledmore junction. Advice about travelling on single track roads may be found by clicking here. Beware of deer on all the roads north of Inverness. They are particularly difficult to see at night and will cause significant damage to your car if you hit one. Sheep are also a hazard on the roads, and in spring and early summer lambs will tend to run towards their mothers as your vehicle approaches, even if this means they run straight into your path. Many roads are untreated in winter, so beware of ice. As a minimum (under good conditions), allow the following times for travel by car: 2 hours from Inverness, 6 hours from Glasgow, 9 hours from Yorkshire, 13 hours from Hampshire (assuming rest breaks every 2 hours). Images produced from the Ordnance Survey Get-a-map service. Image reproduced with kind permission of Ordnance Survey and Ordnance Survey of Northern Ireland. There are scheduled flights between Inverness Airport and Amsterdam, Belfast, Benbecula, Birmingham, Bristol, Dublin, Jersey, Kirkwall, London (Heathrow, Luton, Gatwick), Mallorca, Manchester, Stornoway, Sumburgh and Zurich..
Inverness is also linked to the rest of the UK by good coach and rail services. It is possible to travel by bus from Inverness to Clashmore but services are rather limited, and the most practical option would be to hire a car for the duration of your stay in Clashmore from the airport or from the city centre. Nevertheless, many visitors to the area get great pleasure by researching the public transport options (school bus, service bus, cycle bus etc) and planning their holidays accordingly.